THIS ITEM IS NOT AVAILABLE AT PRESENT. WE WILL NOT BE GETTING ANYMORE Disney Descendants Mal and Ben Doll Two-Pack. From the Disney Descendants collection by Hasbro. 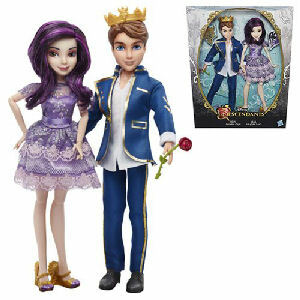 Disney Descendants Mal and Ben Doll Two-Pack. Dolls measure 11 inches tall. Each collectible doll has rooted hair - cloth clothing and comes with a cool accessory like a book or a mirror. Ages 6 and up.